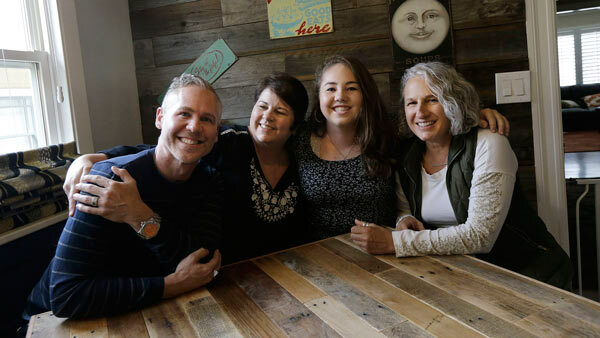 Sixteen-year-old Madison's family clustered for a photo in a California courtroom, commemorating the day it finally became official that she has three parents. The adults she calls Mom, Dad and Mama were all there for her birth, after the women decided to have a child together and approached a male friend. They shared time with Madison and input on raising her. Their Christmas Day traditions involve all of them. But legally, Victoria Bianchi became her daughter's parent only this fall, joining a small but growing number of Americans who have persuaded courts and legislatures to give legal recognition to what's sometimes called "tri-parenting." "I just felt like I've been holding my breath for the last 16 years," Bianchi said. "She's already been my daughter ... she's finally, legally mine." Bianchi made use of a 2013 California law declaring that a child can have more than two parents. A similar law took effect in Maine last year. Courts in at least 10 other states , including New York just this winter, have designated third parents in recent years, even as some courts and experts have raised qualms that more parents means more potential conflict. American courts have for decades granted some rights to grandparents, stepparents and others in children's lives, but parents have uniquely broad rights and responsibilities. Advocates say acknowledging a third parent - whether on a birth certificate, by adoption, or in a custody or child support ruling - reflects the modern realities of some families: gay couples who set out to have a child with a friend of the opposite gender, men seeking to retain paternal roles after DNA shows someone else is a biological father, and other situations. The landscape is only getting more complex. For instance, new techniques designed to avoid some rare diseases now allow for a child to be born with a small amount of DNA from a third person. Without legal rights, some parents and kids face being cut off from each other, says Cathy Sakimura, of the San Francisco-based National Center for Lesbian Rights, which helped draft California's law. But some courts have rejected extending the bounds of parenthood. A 2014 Wyoming Supreme Court decision wondered about parents multiplying as a mom or dad had new relationships. While there's little if any research directly on tri-parenting, experts are divided on how it may affect children. Anita Jones Thomas, a University of Indianapolis professor who heads the American Psychological Association's child-and-family section , sees potential pluses. "That extra sense of social support has really been found to be beneficial for children," she says. But W. Bradford Wilcox, a University of Virginia sociologist, points to research - not on tri-parenting specifically - showing that children in stable, two-parent families do better on average educationally, emotionally and otherwise than kids who aren't. "This is going to be a family form where children are exposed to more complexity and more instability," he says. When a quip about having a baby together turned into a serious discussion, Kitty Stillufsen, her longtime friend Darren Greenblatt and his now-husband, Sam Hunt, didn't foresee how complex tri-parenting would get. The girl was born in 2009, with Greenblatt's and Stillufsen's genes and Hunt's last name. They spent part of the infant's early months together in Stillufsen's New Jersey home. Later, the Manhattan-based men rented a house in Stillufsen's seaside hometown in summers, her busy season managing her family's restaurant. She and the pre-schooler spent winters in Costa Rica. "We're a family. We're the real thing," Stillufsen told Marie Claire magazine in 2011. By 2013, Stillufsen was planning to marry a boyfriend in California and enroll the girl in school there. The men objected and sued for custody. Finding that Hunt was a "psychological parent," a New Jersey judge awarded custody in 2015 to all three adults and nixed Stillufsen's planned move. All now live in New Jersey. Hunt wasn't declared a legal parent, however. The judge said lawmakers needed to decide whether to give tri-parenting such recognition, a social policy choice likely to have "far-reaching implications." Regardless, Hunt, a teacher, says the ruling gave him "a sense of security and peace" after "the pain of having to defend that relationship and prove that relationship." But to Stillufsen, tri-parenting has turned into a two-against-one fight. The judge found she and Greenblatt were fit parents. "Why do we need a third?" she asks. And she wonders where will courts now draw the line on who's a parent in other families. "At what point does it end?" says Stillufsen, now a teacher in training. "How many parents can a child possibly have?" She now thinks tri-parenting is "logically dangerous territory" that risks creating turmoil around kids. Greenblatt and Hunt still believe it can work, with detailed planning. "We were naive," says Greenblatt, a fashion entrepreneur and bakery co-founder. "Our example should be a cautionary tale." "But then again, we have this beautiful, smart, funny, amazing kid," he says. Tri-parenting hasn't been uncomplicated for Victoria Bianchi, former partner Kimberli Bonner and friend Mark Shumway. When Bonner gave birth to Madison in 2000, the law allowed for only two legal parents, so Bianchi couldn't adopt unless one of the others gave up parental status. Shumway knew it was important to Bianchi. But "I could not do that, sign away the rights to my daughter," he says. Bianchi was heartbroken and stung by the limitations of not being a legal mom. The insurance estimator cried after trying to register the girl for kindergarten and being told: "Oh, you're not a parent?" Still, the three adults collaborated: "Madison was the most important thing to all of us, so we just wanted, whatever the differences, to work through it," says Bonner, a tech company claims adjuster. Shumway, a real estate agent, appreciates their three-parent family so much he hopes to form another with his husband and a woman. Madison Bonner-Bianchi says her relationship with her parents resembles anyone else's - "I just happen to have three of them." Now 17 and busy with school, sports and friends, she allows it sometimes takes effort to round up opinions from three parents. "But the big picture is: You just have more people there to support you and be there for you and love you no matter what," she says. "Honestly, I look up to all of them." And so, one October day, she and her family assembled in a Bay Area court for Bianchi to adopt her as a third parent. "Do you understand what this means?" Bianchi recalls the judge asking. Without any doubt, she said yes. Associated Press writer David Crary contributed to this report.